Brickell Bay Drive is one of the many busy roads within the Brickell neighborhood. It is lined with high rises and construction cranes. It is also congested with automobile and pedestrian traffic on most days. 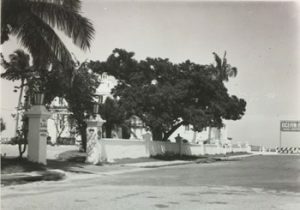 The cover photo is a postcard of Brickell Bay Drive in the mid-1950s. However, at the time the picture was taken to create the postcard, the street was called South Bayshore Drive. The road was configured very differently in the 1950s than it is today. The postcard provides an aerial view of South Bayshore Drive from Twelfth to Fourteenth Streets. Several garden apartments, a hotel and a former prominent office and home resided in this part of the Brickell neighborhood in the 1950s. This article will describe some of the buildings featured in the postcard. At the very center of the postcard are the Jackson office and home. Both structures were moved from downtown Miami in 1916. The buildings were built and owned by Dr. James Jackson. In an effort to preserve his home and office, he listed both buildings for sale. 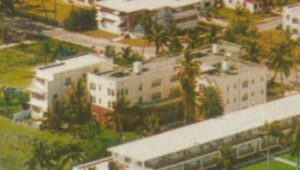 When he didn’t find a buyer, he decided to move the buildings to property he owned on Miami Beach. However, while he was loading the buildings onto a barge for their move to the Beach, Miami pioneer H.T. Whaler purchased the buildings and moved them to the corner of South Bayshore Drive and Southeast Twelfth Terrace. The buildings were two of the earliest structures in the area along South Bayshore Drive. The building on the corner of South Bayshore Drive and Southeast Twelfth Terrace was Dr. Jackson’s surgical center and office. It remains at the same location today and is now the headquarters of Dade Heritage Trust. The building directly west of the former office was Dr. Jackson’s old home. Over time, it had fallen into a state of disrepair and was razed in 2004. The Solaris condominiums reside on the property of the location of Dr. Jackson’s former home. Directly across the street from the office, on the east side of South Bayshore Drive, was the Fredora Court Apartments. The apartment complex was built in 1922 by Fred W. Brown. He was an early resident of Miami and decided to get into the apartment management business. The name of the apartments was a combination of the couple’s name. Her name was Dora which created a combination name of “Fredora”. When it was built, there were twenty five furnished apartments. The apartments were advertised as roomy, with spacious sun porches and the highest grade of furnishings. The complex was set up to provide accommodations for the part-time, winter visitor. The apartment complex expanded by adding an annex next to the original buildings several years later. The apartments kept the Fredora Court name until the mid-1940s. The name changed to the Bayshore Drive Apartments in 1945. The complex remained standing through the 1960s and was demolished in the 1970s. South of the former Jackson office and home, on the same side of the street, was the Longacre Villa Apartments. These apartments were built in 1949. The address for the building was 1300 South Bayshore Drive. The name of the complex changed to the Pacini Apartments in the mid-1960s. The building stood until the mid-1970s. The Brickell House Condominiums now occupy the property where the Longacre Villa Apartments once resided. Directly north of the Jackson office and home, on the same side of the street, was the South Bay Shore Apartments. They were located at 1204 South Bayshore Drive. The apartments were built in 1950. The apartment building only remained standing until the early to mid-1970s. The property is now host to The Club at Brickell Bay Condominiums. The Ocean Ranch Hotel began as a conversion of an old mansion that became the main building of the sprawling hotel complex. The mansion was built by the widow of Walter B. Pearson, president of Chicago-based Standard Screw Company. Helen Pearson built the Italian Villa styled mansion in 1917 and sold it after just three years of ownership. Huston Wyeth, a wealthy businessman from St. Joseph, Missouri, purchased the home in 1921. He lived in the mansion with his family until he passed away in 1925. His widow, Leola Wyeth, continued to winter in the Italian Villa until the early 1940s. Harry Dewitt purchased the home in the mid-1940s and converted it into the Ocean Ranch Hotel. Over time, Dewitt expanded the hotel to include the complex directly south of the mansion. The building with the red roof and the two story motel structure was part of the expansion. The pool faced the bay on the south side of Southeast Twelfth Street. The Ocean Ranch Hotel advertised as a family friendly destination. The hotel would routinely sponsor shows to keep the guests entertained. In 1952, advertisements in the Miami Herald promoted a fashion and water show that took place at the Ocean Ranch Hotel pool. By the late 1960s, the Ocean Ranch Hotel was sold for approximately $1.5 million. The hotel was razed by 1970. The Mark on Brickell Condominium was built in 2001 on the site of the former location of the Italian Villa mansion. The site of the hotel’s pool and annex is currently vacant but will be the future home of The Towers by Foster + Partners. The project is a Tibor Hollo development and was originally going to be called Villa Magna before getting a name change this year. The Norman Foster designed buildings are expected to be 1,049 feet tall and will be the tallest buildings in Miami when they are completed. In addition to the change in composition of buildings in the neighborhood, the street has also experienced significant changes since the 1950s. In the mid-1960s, South Bayshore Drive was extended from Southeast Twelfth Street to Southeast Eighth Street. Prior to this change, the properties on Brickell Avenue extended all the way to the bay between the two streets. In 2004, the Miami City Commission passed a city ordinance to change the name of South Bayshore Drive to Brickell Bay Drive. Whether it was to make the street name more consistent with the neighborhood or to eliminate confusion, the city felt Brickell Bay Drive was a more appropriate name. There may have been confusion given that South Miami Avenue changes into South Bayshore Drive in Coconut Grove. The Brickell neighborhood has experienced a lot of change in the last half century. There isn’t any place in the neighborhood that highlights that change more than today’s Brickell Bay Drive. It has gone from a quiet neighborhood dotted with garden apartments, single family homes and an iconic hotel, to a street lined with skyscrapers. It won’t take fifty years to see even more change. Brickell is a neighborhood that will continue to evolve as long as there is available land. Cover: Postcard of Brickell Bay Drive in 1950s. 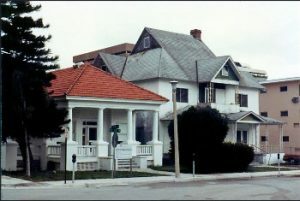 Figure 1: Dr. James Jackson Office and Home in 1984. Figure 2: Fredora Court Apartments. Figure 3: Longacre Villa Apartments. 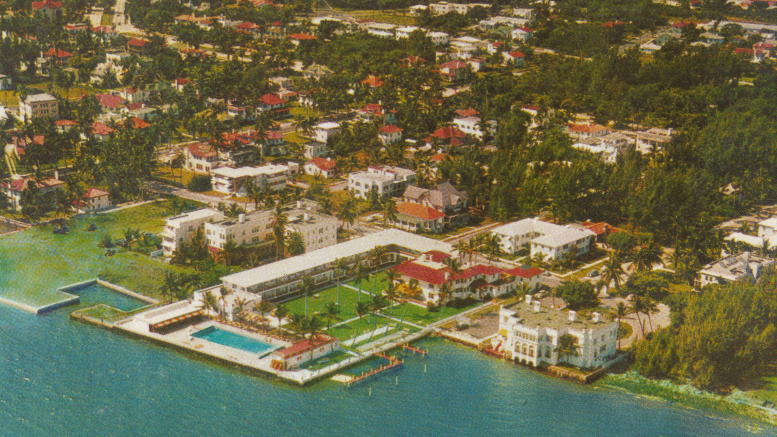 Figure 4: South Bay Shore Apartments. Figure 5: Ocean Ranch Hotel Entrance in 1951. Courtesy of Miami-Dade Public Library System as part of the Romer Collection. 3 Comments on "Brickell Bay Drive in 1950s"
Enjoyed your article, it makes me so sad to see old Miami destroyed. Miami is a city that does not conserve its History. As a child I attended Academy of the Assumption on Brickell Avenue. We took many walks down Brickell and South Bayshore Drive. Assumption didn’t have a pool so arrangements were made with the Ocean Ranch for us to use the pool. It is hard to see all the highrises that are there now and remember what used to be there! !